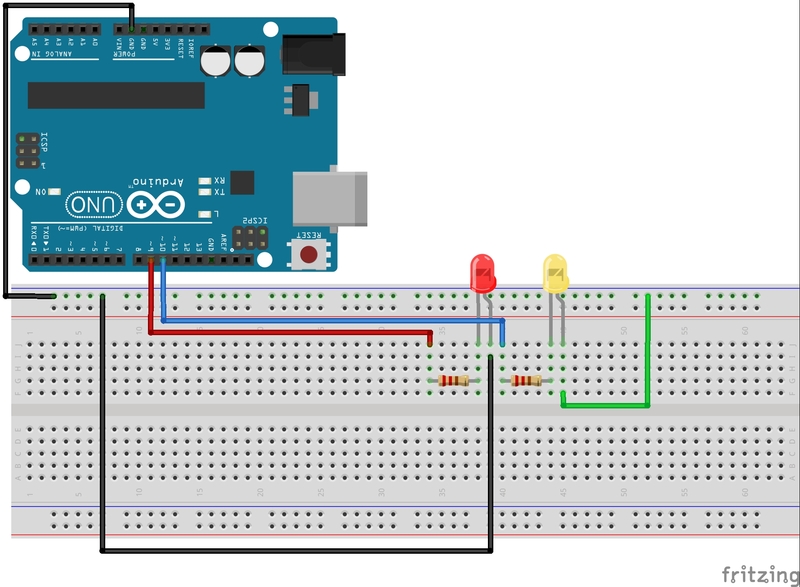 In this lesson we will create a circuit and write arduino code to control two LED’s. You can jump right to the video, or read through the tutorial. In the earlier lessons we wrote our first programs and built our first circuit. At this time you should be getting comfortable with how the breadboard works and how to work with variables and digitalWrite commands in the arduino IDE (Integrated Development Environment). Now we are going to build a slightly more complicated circuit for controlling two LEDs. Since we want to control each one individually, you will need to have a separate arduino pin control each LED and each LED should have its own current limiting resistor (330 ohms). You should be able to sketch out your own circuit at this point. This is a diagram of the circuit we will be using. Yours does not have to be exactly like this, but it should have the same function. Notice that in this circuit, the shorter leg of both LED’s needs to be connected to ground. In order to accomplish this we run a wire from the ground pin on the arduino to the top row of the breadboard. This makes the top row “ground”. Now any device that needs to be grounded can just be connected to the top row, since that row of the breadboard is connected all the way across (See LESSON 1). Also note that both LED’s have their own 330 ohm current limiting resistor, and remember that the direction matters on diodes . . . be sure to put them in with the longer leg connected to the more positive part of the circuit . . . in this case, the longer leg should be connected to the resistor (since the resistor connects to the + voltage coming from the arduino pin). Photograph of our Arduino Circuit for Controlling Two Diodes. Now that your circuit is built, we are ready to do some programming. Now that your variables are declared, what should you do next? That’s right! You need to work on your void setup(). In your void setup you will need to set your pinModes. Since you are using 2 arduino pins this time, you need to issue two pinMode commads as follows. Things are moving along and we are now ready to do our main business in the void loop(). Remember our goal is to blink the Red LED ten times, and then blink the yellow LED one time. OK, now you are ready to run your code. If you did it correctly, it should run, and blink the red LED ten times, and then blink the yellow LED one time. If it does not run correctly, you need to debug your code. If it does not work, it is because you made a mistake. Most of the time it is silly typos or forgetting to end lines with a semicolon. Check your work, and you will find your error. Sometimes it helps to have someone else look it over with you. OK, hopefully you have your code and circuit working now. You can play around with the parameters, and you can see that you can make the LED’s do whatever you want them to. OK, there is lots going on with this new code, so lets break it down. First, notice the open and close curly brackets. All of the code or command lines you put between the curly brackets will be the code that is executed in the for loop. You can put as much or as little code as you want in the for loop. Now lets look at the first line that actually initiates the for loop. Inside the parenthesis are the parameters or arguments that define the behavior of the loop. Notice first that we have introduced a new variable, j. Since we do not need this variable in other parts of the program, we make it a “local” variable. That is, we do not declare it at the top of the program, but declare it just when we use it. That is why we have “int j=1”. The int is declaring that we are going to use a new variable called j. Now j=1 is telling the loop to start with a value of j of 1. Then the j<=10 says to continue to loop as long as j is less than or equal to 10. Then after the next semicolon we have j=j+1. This tells the arduino that each time through the loop, increment j by 1. So, inside the parenthesis we are telling the arduino to start looping with j set equal to one, to continue to loop as long as j is less than or equal to 10, and each time through the loop to add 1 to the value of j. Remember that our goal was to blink the red LED ten times and blink the yelow LED one time. We need to add a little code so that the LED will blink yellow. This should be done AFTER the for loop. WOW, that is a huge improvement over our original code. The for loop makes it much easier to manage things. The one thing that I don’t like about what we did in the code above is that we looped to the constant value of ten. It would be better and smarter to declare a new variable at the top of the program, The new variable could be numRedBlinks. Then in the for loop we would loop until j<=numRedBlinks. Then at the top of the program we could set numRedBlinks to however many times we want the red led to blink. OK, I have done lots of the work for you in the above example. Now, I want you to write a program where the yellow LED is also controlled inside a for loop. So, you would declare at the top of the program two new variables . . . numRedBlink and numYellowBlink. The program would have a for loop to blink the red LED numRedBlink times, and then blink the yellow LED numYellowBlink times. Good Luck! Sparkfun Inventor’s Kit : While the bare arduino will get you started, I really suggest getting the Sparkfun Inventor Kit. The projects I will feature in this tutorial set will use the components in this kit, and it is probably cheaper to go ahead and get the kit than to buy the individual components as you go along. The kit is under $100 on Amazon. Thanks a lot and keep teaching as. Thanks Daniel Pantilie and thanks My Teacher. All worked well with the first part but after the swop to ‘for’ code I’m getting errors. Could you please correct me with what I have done wrong. I dont think you want the () after the word “for”. I corrected it but it still didn’t work. It did correct some of the script but after adding ‘}}’ at the end it now works. Here’s the amended script (for anyone who has had similar problems). I am an absolute beginner and love your tutorials. Many thanks for your time and making these lessons public. I am infeed most grateful. If j is your counter make sure you declare it as an int in the top of your program. I am simply trying your code in my version of arduino. Hi many apologies. I am totally lost with this code but would like to learn how to make it work. how do I ‘declare’ int counter j? If you are totally lost, you should probably go back and watch the first two lessons. Make sure to watch the video, as it shows exactly how to do it. what it means is j start at 0 then increment till it is less than 10 so altogether loop for 10 times because its start from 0. Don’t do it that way. If you are declaring a variable dont set it to another variable. If you must set it to something, set it to a constant. Nice Tutorial, i think i can now start transferring the Knowledge to my student. My for is not changing colors What am I doing wrong? These lessons are superb. Thanks for your time, I am using what I learn from you to help teach my students. When technology teaches understanding the world becomes a better place. Excellent lesson. I had the hardest time wrapping my head around for loops for the longest time, but this made it clear as day. I’m looking forward to sitting through the rest of your videos. Excellent work. I used to code in BASIC 40 years ago. this example shows the much more efficient looping functionality then the old FOR/NEXT looping in BASIC. 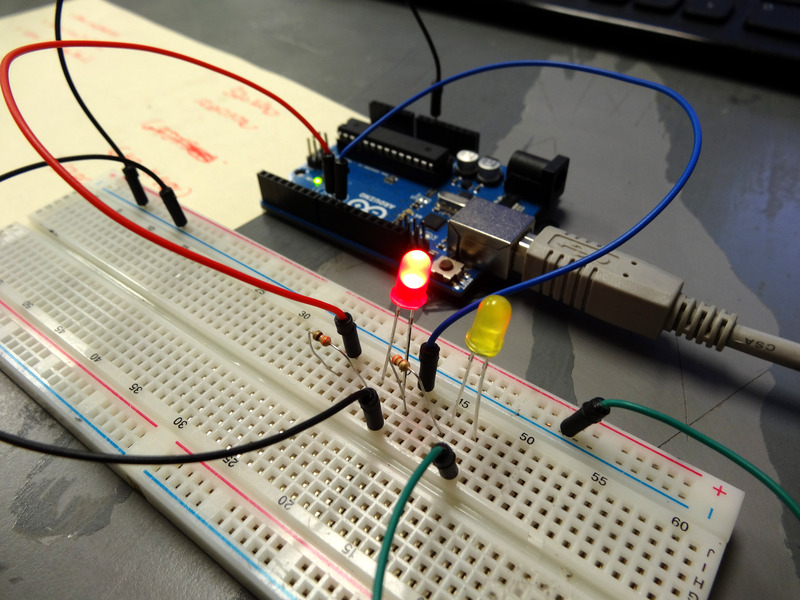 From one teacher to another…Let me say, these are the best lessons on the web for beginning Arduino. Either will work. You are limiting the current, which means it just needs to be in series with the diode. Hi, I’m having the same problem as Andy back in August 2015. My for is not changing color and I wonder if tha is causing my error. I am using ver. 1.6.8 with Windows 10. All was going well with lesson three with this ultra novice. For some reason my for loop doesn’t turn red when typed and I cant get it to work. Also I am not too clear on the curly bracket placement either. I seem to be doing something wrong. Any helpful suggestions?? Really enjoying the lessons so far, but am scared something that looks so easy is causing so much grief with no red colored for when typed. Thanks. Anybody? I wanna fix this little glitch and keep learning. Thanks and sorry for being so impatient not waiting very long. I managed to trouble shoot this issue by previous posts and a little bit of experimenting. As suggested at the end of the tutorial I ran another loop (I used I instead of j ) to make the yellow LED behave the same in turn as the red one. It was a very good experience of problem solving and I have a much better understanding loops now. Thanks a lot that I found you in webpage, otherwise it would be difficult for me to learn operating the arduino. I have received you as my teacher in my heart. Best wishes for you. By the way… I actually got to know about arduino when I was finding a way to make an incubator for my little quails. I came to learn that Arduino is a free hardware that can be manipulated to control temperature, humidity and motor. Now I am learning programing language and your tutorials are greatly helping me. Could you please suggest me any easy way to multi-task in Arduino? If I use ‘delay’ in program it seems impossible to execute other works simultaneously. So if I could get a video tutorial/suggestion on multi-tasking in Arduino Uno R3; it would be very helpful for me. can any one tel me why the for loop do not work on my programing. it does not repeat it self. it works like there are no for loop. if push button one pressed output should 45sec in pin 13 and in between (45sec) how to bypass second push button commend . After 45 sec second button press output 10sec in pin 13 and in between 10sec how to bypass first button commend. I connected my circuit exactly as illustrated, but the second LED on the board does not light up. How can I troubleshoot this or is there a specific reason why this might be happening. The first LED blinks just as per the specified delays. Would very much like to know why the ground in series didnt work. Thank you for very informative lesson No3. All has gone well with me with one exception! On the for loop entry I have written exactly as you say but am only getting the number of blink times written down (j=<10) less 1. (9 blinks only)?? When I type the ‘for’ command it does not turn red.